Oblique aerial view centred on the remains of the settlement, taken from the WSW. 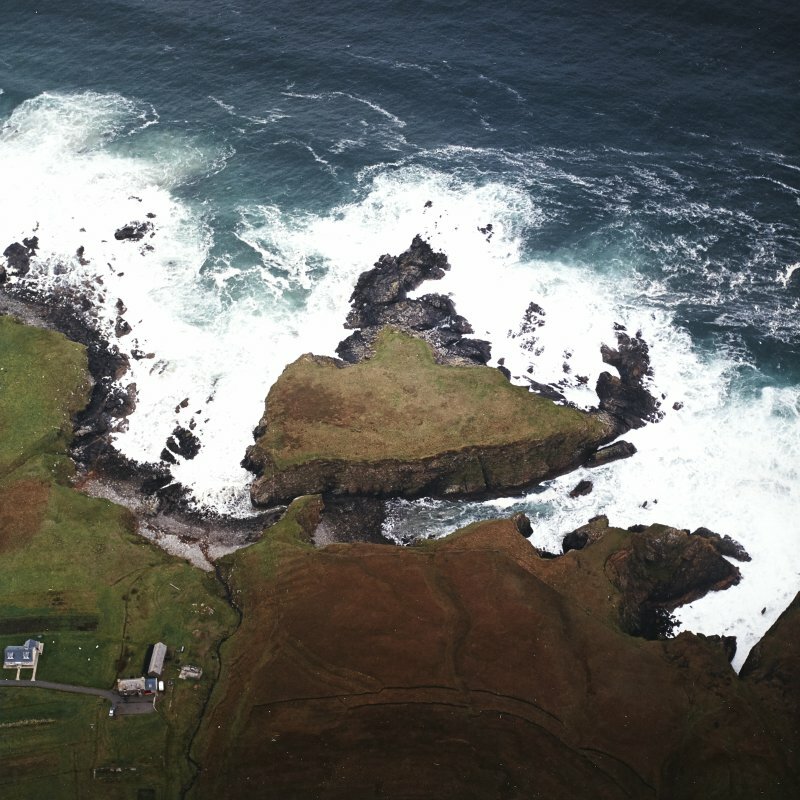 Oblique aerial view of the remains of the buildings on Dun Eorradail, taken from the SSW. Oblique aerial view centred on the remains of the settlement, taken from the SSW. "Dun-coradil" - a natural fort. Name collected as 'Dun Eorradail', but changed to 'Dun Eorodale' on authority of Col J Farquharson, DG, and Mr J Mathieson, OS, 1895. "A small but high island, which is isolated only at high water. There is the site of an old building on its summit, more like the site of a shealing than a castle." Dun Eorradail (in English, Eordale): "a small tidal island joined at low water to the main by an Eyrr or Ore, ie. beach, and which has apparently been fortified by a wall". 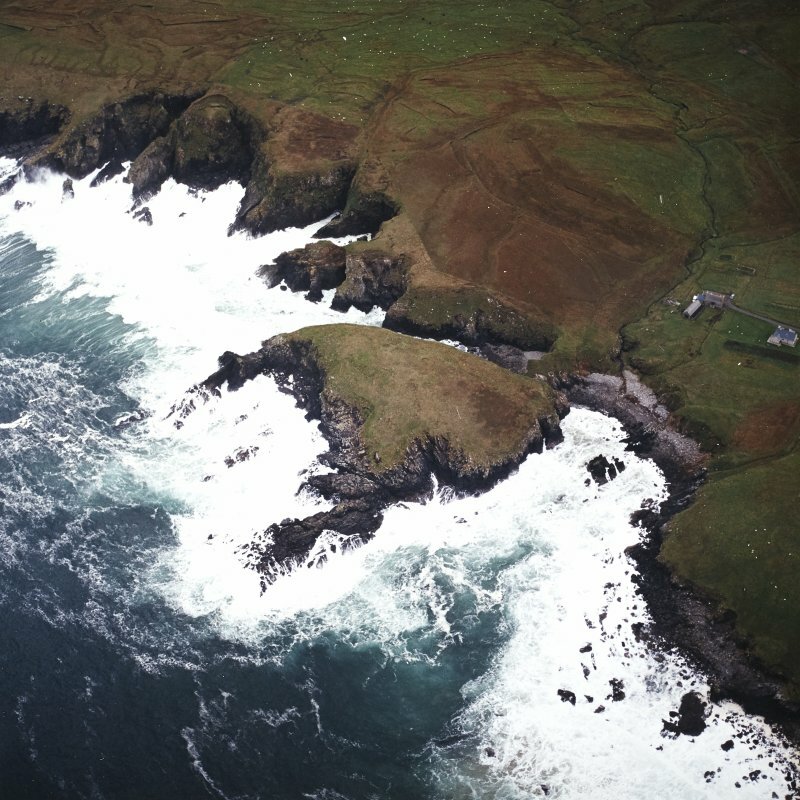 Dun Eorradail is a flat-topped stack, difficult of access, measuring about 150.0m by 100.0m, separated from the mainland by a ravine and isolated at high water. It is occupied by ten small rectangular stone-built huts with rounded corners, now heavily turfed. There are slight traces of a wall along the NE side of the island but this does not seem to have been defensive, and was probably a turf wall reinforced with stones to keep animals off the cliff. This site is similar to NB56NW 1 and is probably a medieval settlement. There is nothing to suggest monastic associations. Two unroofed buildings are depicted on the 1st edition of the OS 6-inch map (Island of Lewis, Ross-shire 1853, sheet 3), but they are not shown on the current edition of the OS 1:10000 map (1992). Information from RCAHMS (AKK) 23 June 1997. This isolated rock stack, which is separated from the mainland by a precipitous ravine, stands at the S end of the bay at Port of Ness. Cliff-girt and inaccessible around the landward side, a wall can be seen extending along the lip of the ravine, though in the opinion of the OS surveyor who gained access in 1969 it appeared more life a field-dyke than a fortification. 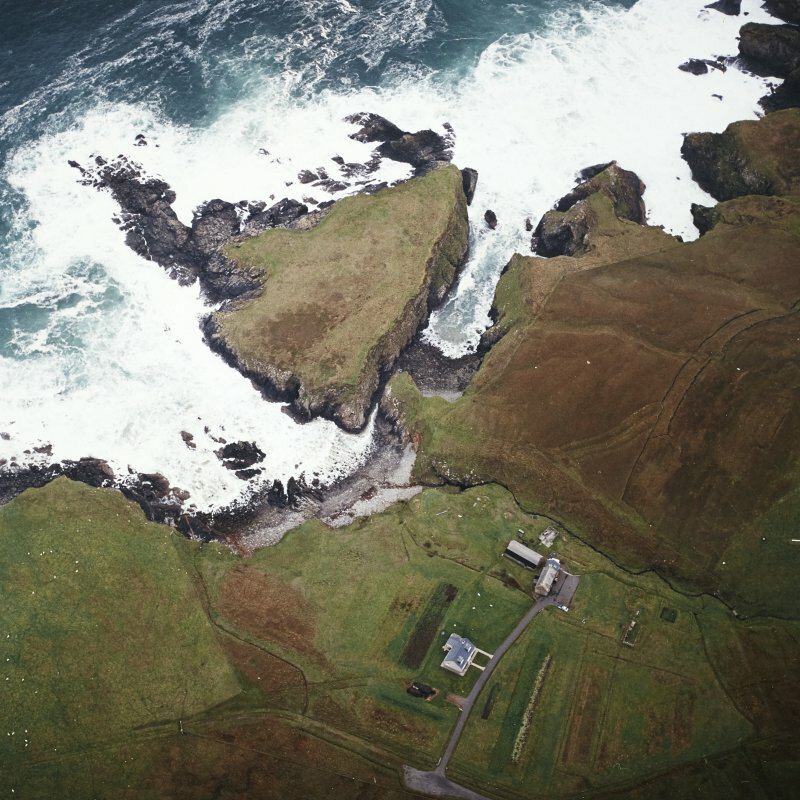 Indeed, aerial photographs and satellite imagery suggest this dyke encloses the whole of the flat summit, an irregular area measuring 150m from ESE to WNW by a maximum of 90m transversely (0.78ha). Within this area there are at least ten rectangular buildings, presumably a settlement of medieval or post-medieval date and accessed from the spine of rocks that runs out into the sea on the NNE. 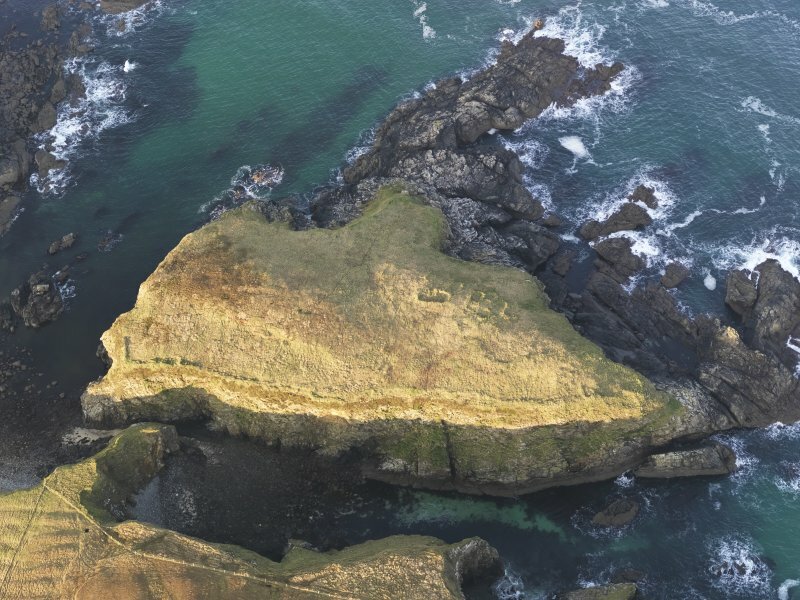 A natural stronghold, it should perhaps be compared with Dun Eistean (Atlas No.2772) a little further north, where excavations on a similar location have failed to reveal any evidence for occupation or fortification prior to the medieval period.